What the Double Denomination is this? 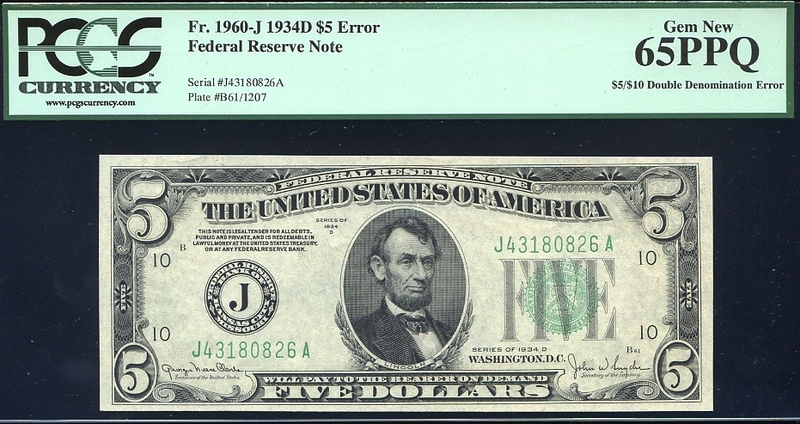 To both collectors and non-collectors, true double denomination error notes evoke awe and wonder. How the heck did this $20 bill get printed with a $10 back? Was the press operator drunk or remiss in his duties? So much for government quality control! One must remember that the government has printed BILLIONS of pieces of currency since the Bureau of Engraving and Printing’s inception in the 1860’s; and of course, there are bound to be mistakes both human and mechanical. For the record, the double denomination error is strictly the fault of man: it occurs when the back of one denomination gets printed on a sheet of paper, and this same sheet later gets shuffled into the printing process of a different denomination’s FRONT. It’s an understandable mistake and usually gets picked up by B.E.P. staff right away. When it goes undetected, collectors get an awesome opportunity to acquire the most fabled of all printing errors. His high praise is not unwarranted. The double denomination is commonly regarded as “The King of Errors” among paper money enthusiasts (whether you like ’em or not 🙂 ). Bart writes that all issues of USA currency have examples of double denomination errors, including Fractional Currency, Large Size Notes and Small Size Notes. Of the three archetypes, the most errors have occurred on Large Size notes, most notably on National Currency issues. This is due to the fact that sheets of Large Size National Currency contained more than one denomination. As a result, the mere mishap of putting a sheet through the press upside down would produce the double denomination mistake. It’s important to note that the population size of Large Size National Currency errors isn’t necessarily due to lackadaisical press operators. Sheets contained 4 notes each, thereby only producing a small number of error notes. Instead, it’s the sheer scope of printing notes across thousands of banks that accounts for the bountiful number of National Currency double denomination errors.The other notable population of Large Size double denomination errors is the 1918 $2/$1 Federal Reserve Bank Note (Bart, 35). A parting word of advice: Unless you’re highly experienced in detecting counterfeit currency – and more crucially counterfeit error currency – we strongly suggest only buying slabbed notes from prominent dealers and/or auction houses. There have been several instances of double denomination Federal Reserve Notes discovered from recent issues that turned out to be the work of fraudsters. 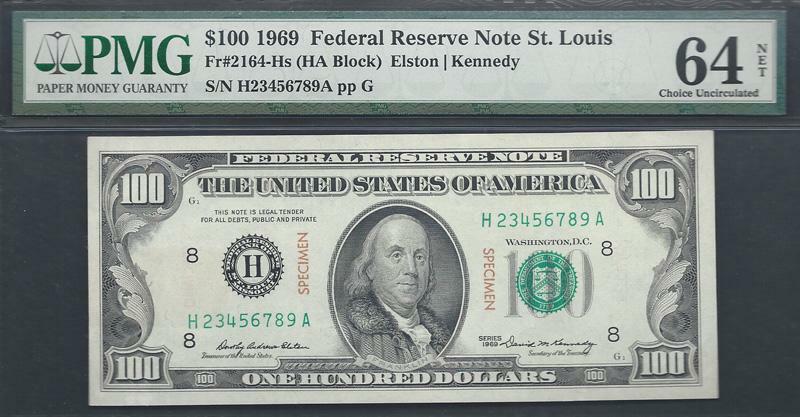 Always do your research before purchasing one of these notes, and make sure it has been properly authenticated. Dr. Bart’s book, United States Paper Money Errors: A Comprehensive Catalog and Price Guide, is available from Krause Publications. It also details a host of other types of error notes in addition to its thorough discussion of the double denomination error. What is a United States Paper Money Specimen Note? If you’ve browsed any large website reselling collector currency, no doubt you’ve stumbled upon notes marked “Specimen”, with a solid 00000000, 12345678, or 23456789 serial number. What the heck are these notes, and why are they marked “Specimen”? “Specimen” notes are issued for other governments or law enforcement agencies to use as a comparison to currency suspected of being counterfeit. 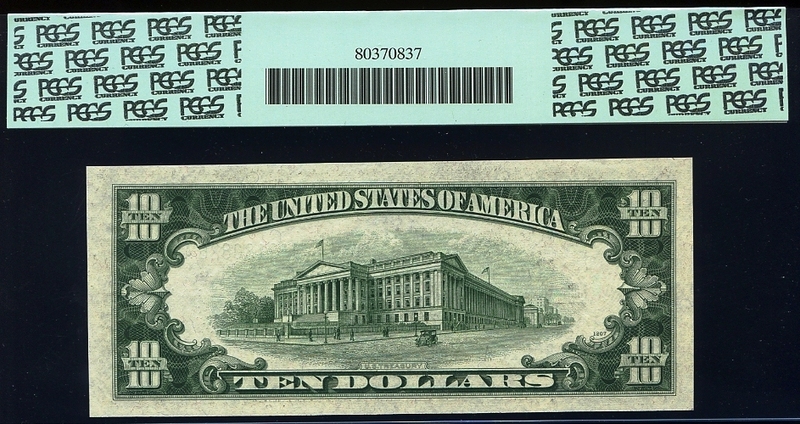 Additionally, specimen notes were often sent to foreign governments in advance of new series issues of United States currency to alert them to changes in signatures and/or design before regular notes started circulating on the street. This kept foreign governments and important law enforcement agencies “in the know” about the US currency circulating throughout the world. As a practical matter, sending specimen notes to other governments allowed them to police counterfeit operations within their own borders, essentially saving the US government the headache of deploying extra secret service personnel to foreign soil. Once they were acquired by a foreign government’s central bank, specimen notes were usually mounted with pins or by the left-hand corner of the note. This allowed the note to be viewed from the front and back while keeping it safely inside an archive. Although this may seem like a very antiquated method of detecting counterfeit currency, one must remember the technological limitations of years past and the few methods available to deter counterfeiters. More importantly, if a government didn’t have an example of a note that it knew was 100% authentic, how could it effectively identify bad notes being passed around by its citizens? Specimen notes are regarded as rare by most standards, simply because they were printed in minuscule quantities and sent securely to other countries and law enforcement bodies. Recipients of these notes were instructed to hold them for safekeeping. Further, the notes are NOT regarded as legal tender. They were all clearly stamped with the word “SPECIMEN” in blood red ink on the front and back of each note to distinguish them from normal currency. Luckily for collectors, these notes have randomly surfaced from time to time and become available for purchase. Is it illegal to own a specimen note? No, even though the US Treasury probably isn’t happy they’ve found their way into public hands. Mike Abramson, proprietor and operator of ExecutiveCurrency.com, and a frequent seller of specimen notes, has a letter from a congressperson stating that these notes are legal for people to own. Abramson received this confirmation in the early 2000s, just as many specimens from the mid 1900s started popping up. How did these notes seemingly escape from highly secure foreign central banks? This is still somewhat of a mystery, but the most likely explanations are that some foreign banking officials gave them away as gifts to friends or sold them privately to collectors located stateside. Then, as with most other collectibles, they probably quietly traded hands until it was clear the government didn’t prohibit ownership of these special notes. Nowadays, they often show up in major paper money auctions and in the inventories of the hobby’s finest dealers. Slabbed notes that have been determined to have NO mounting remnants are generally more valuable and less common than notes that were mounted. It’s also worth remembering that specimen notes almost always receive a grade of Extremely Fine or higher, because they were not circulated and kept safe. If you’re offered a beat up note marked “Specimen” and it does not have a 00000000, 12345678, or 23456789 serial number, do not buy it, because it is not authentic! Looking to buy a specimen note? Have a look at Executive Currency’s Specimen Inventory – click here. 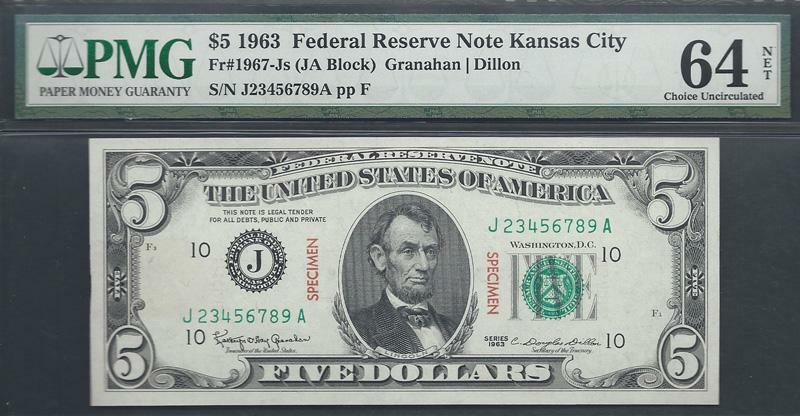 Notes are priced around $2200 a piece, and would make a great addition to your collection! PaperMoneyAuction.com does not receive compensation from any dealer or auction house mentioned in this article for listing notes currently for sale. This information is offered “as is” and is for informational purposes only. Please visit the dealer or auction house websites cited in this article if you would like to purchase a note from their inventory.